6:48 P.M. UPDATE: And read this! Javier Solana has evidently had another highly successful day on his new Middle East tour in pursuit of peace in the region. Read all about it by clicking here AND here. Time for just about all of us to really wake up! UPDATE: Click here for a link to the program site. Tonight, I am privileged to be the inaugural guest on Fr. Tim Ashcraft, a priest of the Orthodox Church confession discussing the New Age Movement. The program is called SPIRIT WARS. 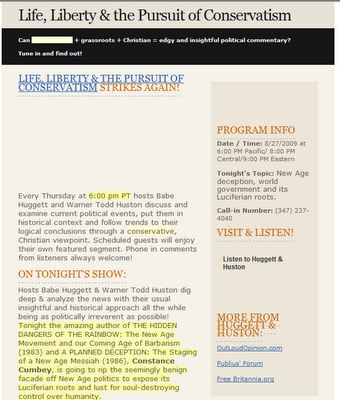 I am chagrined that I don't currently have the link or radio dial spots, but I have emailed Fr. Ashcraft for them and will post them here immediately and in the comments section as well as I have them. 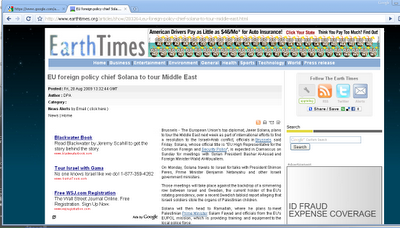 SOLANA ON ANOTHER BIG MIDDLE EAST TOUR -- WHAT'S UP? I haven't seen much on line lately about Javier Solana's supposed upcoming October retirement. I don't know if this is a "Farewell Tour" or "Big Things Are Just Beginning" one. "Brussels - The European Union's top diplomat, Javier Solana, plans to tour the Middle East next week as part of international efforts to find a resolution to the Israeli-Arab conflict, officials in Brussels said Friday. Solana, whose official title is "EU High Representative for the Common Foreign and Security Policy", is expected in Damascus on Sunday for meetings with Syrian President Bashar Al-Assad and Foreign Minister Walid Al-Mouallem. 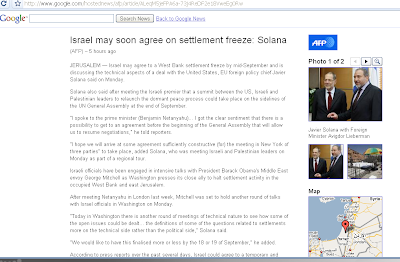 "On Monday, Solana travels to Israel for talks with President Shimon Peres, Prime Minister Benjamin Netanyahu and other Israeli government ministers. "Those meetings will take place against the backdrop of a simmering row between Israel and Sweden, the current holder of the EU's rotating presidency, over a recent Swedish tabloid report alleging that Israeli soldiers stole the organs of Palestinian children. 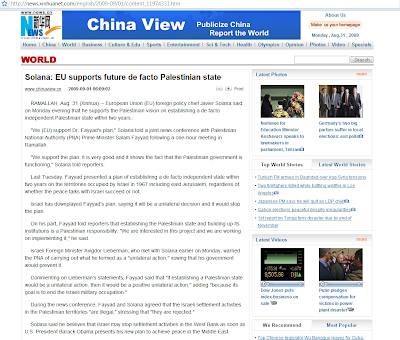 "Solana will then head to Ramallah, where he plans to meet Palestinian Prime Minister Salam Fayyad and officials from the EU's EUPOL mission, which is providing training and equipment to the local police force. "The EU foreign policy chief will on Tuesday head to Beirut before evening talks in Cairo with Egyptian President Hosni Mubarak." UPDATE: I will continue my discussion of basics of the New Age Movement on my own radio program tonight from 8 p.m. to 9 p.m. Eastern Time and thereafter will be on the radio program to the left immediately thereafter for one hour. You can continue throwing brickbats at me there, compliments, questions, roses, rotten tomatoes, or WHATEVER. Senator Ted Kennedy died very early this morning. His sister, Eunice Kennedy Shriver, preceded him in death only a few short weeks ago. I once met the Senator and his son Ted Kennedy, Jr. at Cobo Hall. His son Ted Kennedy, Jr. was a teenager then. I chatted at some length with young Patrick Kennedy and was introduced to Senator Kennedy in a private meeting room where I was privileged to be invited into a high level Democratic Party cloistered meeting. I was active in the Michigan Democratic Party in those days. His son had lost a leg to cancer. He was a nice, polite young man. His father seemed to connect with all in the room. THOU SHALT LOVE THE LORD THY GOD WITH ALL THY HEART, ALL THY MIND, AND ALL THY SOUL A N D THOU SHALT LOVE THY NEIGHBOR AS THYSELF. Too many liberals forget the first half of that equation. Too many conservatives the second. Where Ted Kennedy at the hour of his death stood with the Lord, I do not know. I do suspect, however, that come Judgment Day, he will have relatively high marks on LOVING HIS NEIGHBOR AS HIMSELF. 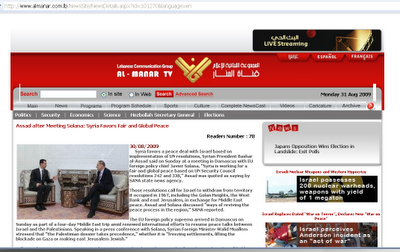 Spokesperson of the SG / HR Javier Solana"
1. Spain will have the rotating EU presidency for the first six months of 2010. (This is where I came in on November 22, 1995. Spain was in the first DUAL COINCIDING PRESIDENCY of the EU and WEU. Coinciding presidencies may not matter so much this time. Javier Solana already has command of the Western European Union. In all his talk of "retirement," I've heard nothing so far about him giving up that. 2. Javier Solana has endorsed him. 3. French President Nicholas Sarkozy has withdrawn his support for Tony Blair, the other strong candidate for the job. The upcoming months should be VERY INTERESTING. Stay tuned! 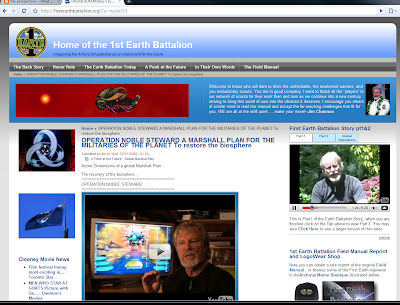 JIM CHANNON, 1ST EARTH BATTALION, PLANETARY WARRIOR? I wrote with concern of Jim Channon and his first earth Battalion in my book, THE HIDDEN DANGERS OF THE RAINBOW. Last weekend I viewed with amusement a series of YouTube video presentations by retired Lieutenant Colonel Jim Channon. On one, he said he had recently googled himself and his First Earth Battalion. It was 30 years, he said, since he "and the army He was "amused" to see how many references referred to himself as "Luciferian." "Did you ever meet a Luciferian in your whole life?" asks Channon. Well, considering all jokes about an alleged oxymoron of "military intelligence" aside, Channon's statements are disingenuous at best, deliberate deception at worst. Channon had close self-publicized associations with Marilyn Ferguson, Planetary Citizens/Donald Keys, Lou Tice (Pacific Institute/ New Age Thinking), Esalen Institute, Findhorn Foundation, et al, ad nauseum. Working closely with Channon these days is a "Captain Dave Lakota" of "Alaska Cavalry Command." Lakota reports, if his (Lakota's) video is to be believed, from the "North Pole Region" saying "Operation Noble Steward is a go -- OVER AND OUT." Channon sits a bit more comfortably ensconced than his "planetary warriors" at "North Pole" commands. He holds forth from Hawaii. He uses a creepily named Arcturus.org requiring a user name and password for full entre. He laughs about his shamanic storytelling saying they are essential tools to build "the world we want." He evidently wants "storytelling with a mask and a little ceremony" to be necessary rituals in corporate cultures. Channon tells of his use of neurolinguistic programming to reprogram people to the planetary warrior mentality he wants. NLP was one of the more sordid episodes of New Age history. 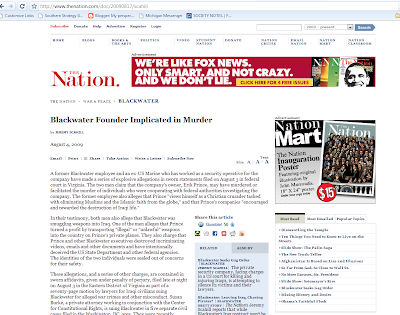 Richard Bandler believed anybody could be "transformed" even if it was at the point of a gun reported a well written MOTHER JONES article in the late 1980s. Channon has relationships with another person I have closely watched -- Paul Temple. Paul Temple, you will recall is a major link between the farthest extremes of the New Age Movement and the most powerful centers of American evangelical Christianity -- "The Family" or "C Street Center" or "Fellowship Foundation / International Foundation", whatever, of Doug Coe any of his successors. Channon is a fellow of the World Business Academy. Channon has also worked closely with Lou Tice of Pacific Institute, another interesting and disturbing New Age/Christian interface. 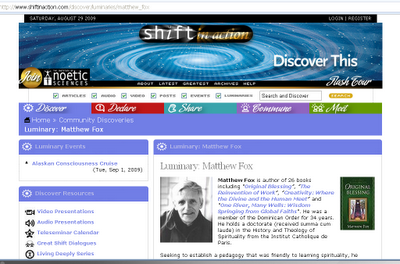 Thomas Nelson and Company published books by Lou Tice long after his New Age agenda was openly exposed. In one of his recently posted youtube videos, National governments per Channon are taking up "too much damn space." They need to be allowed to diminish in their importance, print money in their name, decide 'whose God is best. . .
Another current project of Channon and his ready for mobilization earth warriors is something called Earth Rise which appears, inter alia, to be a propaganda program for school children which includes the sorts of New Age ritual initiation that Channon pursued with military assistance starting in the late 1970s. Channon is practicing a time honored disinformation technique -- the BIG LIE approach. Hopefully, you will not be dumb enough to buy it. His agenda is to pressure people into crossing a forbidden biblical line -- earth worship. The time has come to fear God who created the heaven, the earth, the seas and the fountains of waters. Channon and cohorts would have you worship anybody and everybody but the true Creator. As for me and our house, we shall serve the Lord. If you value your freedoms and more important , if you value your soul, steer clear of Jim Channon and cohorts. Oh, at his Arcturus.org, Channon is selling "original copies" of his "First Earth Battalion" manual, apparently to raise money for himself and his Arcturus.org venture. I've had my own copy since 1982. To read about its HIDDEN DANGERS and FOR FREE, click here and download "HIDDEN DANGERS ANDCOVER"
Have a great day and join me tonight on MY PERSPECTIVE internet radio. Jayanti Tamm was a great guest the other night and I am going to talk to Joe McNeil about rerunning it and/or making it available for download from my PRESENTATIONS FOR DOWNLOADING link here. TONIGHT'S THE NIGHT UPDATE: This is August 18th! Tonight, Professor Jayanti Tamm is my radio guest. I have read her book and am greatly looking forward to the interview. Join us at www.themicroeffect.com. Click "listen live" on the menu choices and if at all possible, please join me in the chatroom. If you have call in questions, the number is 888-747-1968. UPDATE: Professor Jayanti Tamm will be my radio guest on MY PERSPECTIVE internet radio next Tuesday, August 18, 2009, 8 p.m. Eastern Time, 5 p.m. Pacific Time. FURTHER UPDATE: DR. GRADY McMURTRY WILL JOIN US TOMORROW NIGHT, AUGUST 13, 2009 RE THE NAZARENE UNIVERSITIES EVOLUTION FIASCO! "Arriving in the United States in 1964, Sri Chinmoy had vast ambitions. He aimed to infiltrate the United Nations, win a Nobel Prize and gain a worldwide following. His disciples were to lead austere, celibate lives, devoting themselves and their financial resources entirely to his mission. In 1970 when my mother became pregnant — a clear breach of the rules — the guru saved face by divining me as his chosen soul. I was raised in the ashram of this man who declared himself an incarnation of God. 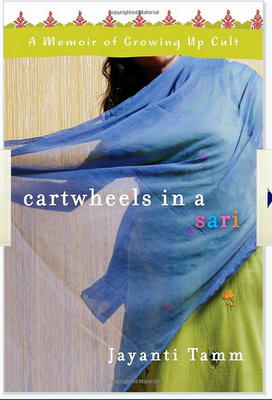 Before I could walk, my parents dressed me in a sari and took me on their recruiting trips. Instead of acting in school plays and playing soccer, I distributed leaflets proclaiming the guru's divinity from parade floats that wound through city streets. I spent summers scrubbing the cages of the zoo housed in the basement of the guru's Queens home. When Chinmoy wanted to attract more media attention, he staged elaborate weightlifting feats, hoisting elephants, helicopters and even Nelson Mandela and Mikhail Gorbachev — a smoke-and-mirrors spectacle I never understood. How could lifting elephants illuminate and ultimately transform the world? When I was a teenager, the guru's strict rules banning all contact and relationships with the "outside" world provoked questions and longings for everything he forbade — college, career and family. When he told me to neglect the mind and forever remain in the heart "like a 7-year-old," I finally realized that he was a narcissistic charlatan, shamelessly exploiting the faithful. "At 25, older than my parents had been when they renounced the world to serve the guru, I was formally banished, losing all my connections to the community I'd known since birth. Fortunately, I was young enough to forge a life on my own terms. "For years, I have struggled with the reckless decision of some in my parents' generation to entrust their present and future to those who claimed to be spiritually enlightened. Cultural historians today portray the '60s as a unique time. I hope they are right. That is, I hope that the cast of corrupt opportunists — gurus, prophets and messiahs — who profited from others' naive belief is indeed a unique '60s phenomenon, safely encapsulated in those glossy anniversary books." Well, so much for "peace, light, and love." I am going to do my level best to track Professor Tamm down and interview her on my internet radio show. Sounds more and more like "Prisoner Planet"
"WAITING FOR THE CHIPS TO FALL" "STRINGENT AIR TRAVEL ID RULES COMING"
Well, the "waiting for the chips to fall" had to do with casino chips at a Chippewa Indian tribe owned gambling casino in the City of Detroit. The other headline, "Stringent Air Travel ID Rules Coming" story by Detroit News reporter Nathan Hurst had a sub headline "Feds wantb more info at booking to compare to terrorist watch lists." 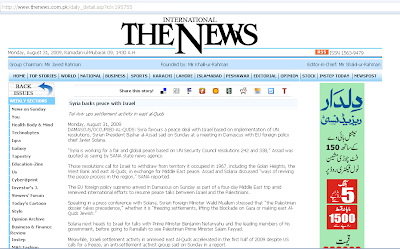 Shades of the Alliance of Civilizations and their "Group of Friends" "Implementation Plans"?? "The Transportation Security Administration wants to know more about who's boarding commercial flights in the United States. "Beginning Saturday [August 15], the federal agency will begin collecting additional data from airline passengers at booking time, including [not limited to?] full name, date of birth and gender. "That data must match whatever is on the form of government-issued identification . . .
"The new requirement will affect all airline bookings made beginning Aug. 15 and is just the first phase of a larger program called Secure Flight." 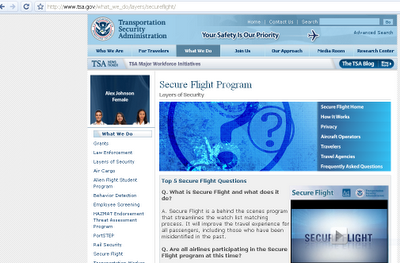 "That program's goal is to vet 100 percent of airline passengers through the TSA's watch lists by next year . . ."
Certainly this is likely to have a most chilling effect on travel. I wonder what the ACLU's position is on this one. I believe I know what their European counterpart, Statewatch, would say. I hope the ACLU is just as vigilant as the European Union watchers on the other side of the Atlantic. Sometimes Alex Jones is just too much for me. However, this time, he sounds rather prophetic. Stay tuned! I will be updating. 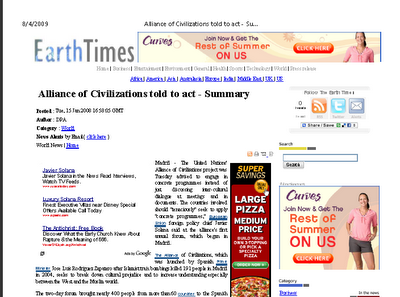 An extremely disturbing new article in THE NATION by Jeremy Scahill may well have disturbing propaganda advantages for the Alliance of Civilizations which has been obviously seeking reasons to implement "GROUP OF FRIENDS" (member nations) "Implementation Plans" against "religious extremism" as their "Group of Personalities" (Karen Armstrong, Federico Mayor, Desmond Tutu, John Esposito, et al) have characterized those of us who cling to the "fundamentals" of our faith. "Crisis = opportunity" to this group and this clearly presents them with a very real one! 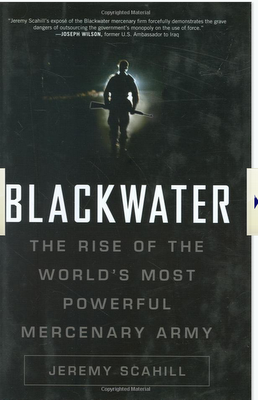 Memeorandum, a high level New Age news service tonight carries a story by Jeremy Schahill reporting that anonymous federal informants "fearful for their lives" report that Blackwater founder, Erik Prince, was either directly responsible for or arranged for the murder of informants against his foreign security company. I have been personally leery of the work of that firm, but I am no less leery of the agenda of those speaking against it as they seek to portray it as Christian crusading run amok. If this is substantiated and/or even remotely believed, how far away can true religious repression for all of us especially those of us believing that "Jesus is the only way" be? I will be updating this story. Stay in prayer and STAY TUNED!